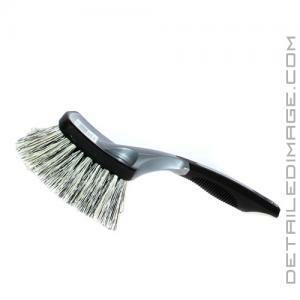 Extremely durable brush and a great value! The DI Brushes Pro Series Wheel Brush will help you clean various wheel types with ease! Wheels are some of the most unique areas with various shapes, sizes, colors, and finishes available. With all of this customization, one brush may not be enough for each and every type. The Pro Series Wheel Brushes come in two great versions, so you know you will have the right brush for every wheel you come across. Firm is great for heavier cleanings and durable wheel finishes, while the soft is better for light cleanings and sensitive wheel finishes. Each brush is 10" long, with a 2" bristle length. The durable plastic construction from top to bottom allows this brush to stand up to the rigors of wheel detailing, but it features two great comfort and safety features. At the top of the brush head, a thermal plastic rubber safety bumper protects the wheel from the hard plastic base, preventing accidental dings, scratches, etc. The ergonomic design of the handle moves the hand away from the wheel, allowing for better comfort and control when cleaning. The thermal plastic rubber grip allows for greater comfort and control, as well as reducing slippage when wet. All of these various quality features make the Pro Series Wheel Brush one you should add to your brush collection today! Firm - 10" Long, 2" Bristle Length, Blue Stiff Polypropylene, resists heat, acids, solvents and chemicals. Great for heavier cleanings where you need a little extra scrubber power. Soft - 10" Long, 2" Bristle Length, Salt & Pepper Soft Polystyrene, resists water, oil, and chemicals. Good for lighter cleanings, or more sensitive areas that require a softer bristle type. SUPER soft brush, that leaves NO marks or scratches whatsoever. The rubber-edging protects my rims from any hard plastic scratches, etc. I'm using it regularly, and it's keeping my wheels nice and clean. Prob not the best option to remove heavy grime & dirt. I love it!